Book Ali Aslan as a keynote speaker. 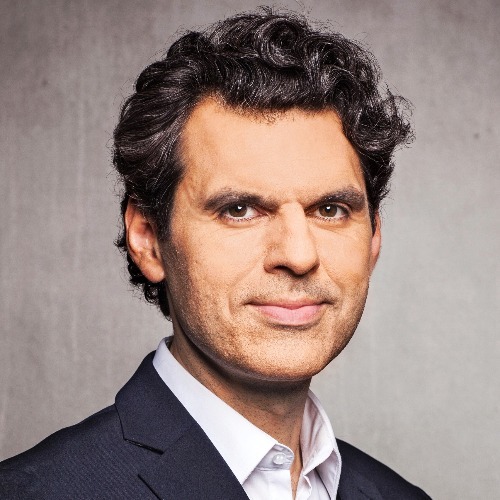 Ali Aslan is the host of the international affairs talk show “Quadriga” on Deutsche Welle TV, which is watched by 200 million viewers worldwide. Born in Turkey and raised in Germany, Aslan has worked as a journalist for leading television networks around the world. His work at CNN, ABC News and Channel News Asia took him to Washington DC, New York, Istanbul, Barcelona and Berlin. For more information on keynote speaker and presenter Ali Aslan, contact VBQ Speakers founding agent Leo von Bülow-Quirk on leo@vbqspeakers.com or 0044 7833 727090. Ali Aslan is an international TV presenter, moderator, public speaker & journalist. He has worked worldwide - from Washington D.C. and New York to Istanbul, Barcelona and Berlin - for global news networks such as CNN, ABC News, Channel News Asia and Deutsche Welle TV. At Deutsche Welle, he hosted the international affairs talk show “Quadriga”, watched by 200 million viewers worldwide. An internationally recognised presenter, Aslan regularly moderates at major conferences around the world and has shared the stage with, among others, Angela Merkel, Emmanuel Macron, Justin Trudeau, Madeleine Albright, Sergey Lavrov, John McCain, Christine Lagarde and Bill Clinton. A former Policy and media advisor to the German government, Aslan is also a frequent public speaker on issues regarding German and European politics and media. He holds masters degrees in Journalism and International and Public Affairs from Columbia University in New York and received his bachelor’s degree in International Politics from Georgetown University in Washington DC. Aslan is a United Nations Fellow and a member of the Körber Network Foreign Policy as well as the Global Diplomacy Lab. In recognition of his achievements, he has been named a Young Leader by the American Council on Germany, the BMW Foundation, the German Marshall Fund, the Bertelsmann Foundation, the Munich Security Conference and the Atlantik-Brücke. With a perspective that spans the Middle East, Europe, the US, policy-making and journalism, Ali is a highly articulate analyst of international affairs, both as a keynote speaker and as a moderator or interviewer. He has shared the stage with some of the world’s most important policy makers and cultural figures. He speaks German, English and Turkish.